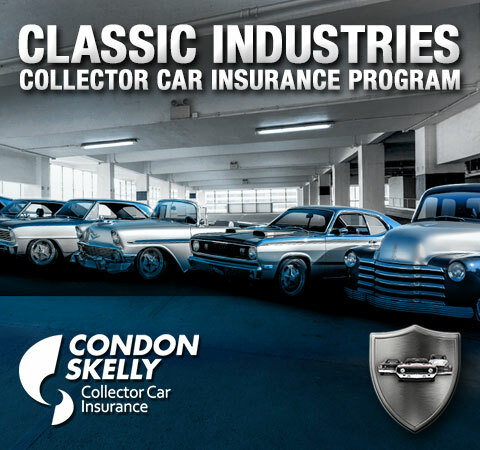 The Classic Industries endorsed collector car insurance program is finally here! Premiums can be as low as $95 per year! This is a preferred collector program, managed by Condon Skelly, the premier source of classic car insurance. This plan features unlimited mileage and a great value for your vehicle. Review the questions below to see if you qualify for collector car insurance. 1) Do you maintain insurance on another daily driven vehicle? 2) Do you use your classic car or truck mainly for shows? 3) Do you keep your classic car or truck in a fully enclosed locked garage? 4) Do you have a good driving record? If your answer is YES to these questions, you are just a few clicks away from saving money! Take few minutes to get a FREE, no obligation quote and see how much you might save. Click here to get started. Apply now at (844) 210-4949 for your Classic Industries Insurance Program today and start saving for as low as $95 per year!